You don't have to be handy with a sewing machine to make an adorable apron. No sew aprons can look very professional, and they make great gifts for your favorite cooks. 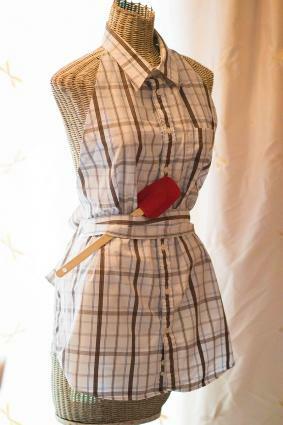 Raid the nearest guy's closet or stop by the thrift store to get a men's button-down shirt, which is the starting point for this cute apron. You may have seen sewn versions of the shirt apron, but this one requires no sewing at all. It mixes the formality of menswear with the flirty and feminine charm of a classic apron design. This project takes about two hours to complete. 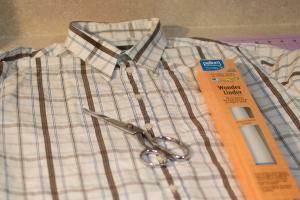 Start by ironing the shirt to make sure the hem and collar are flat. Get rid of any wrinkles in the body panels as well. Button up all the buttons. Lay the shirt face-up on your work surface. Starting at the bottom hem, cut along the side seam all the way to the sleeve. 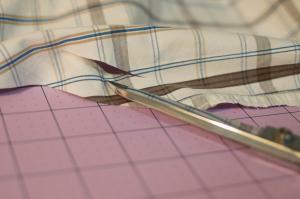 Leave the reinforced side seam toward the front of the shirt, cutting just behind this seam. When you reach the sleeve, cut all the way around the arm hole until you get to the shoulder. Repeat with the other side seam. Starting from one of the shoulders, cut along the shoulder seam until you reach the collar. 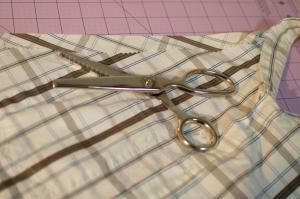 Cut around behind the collar, keeping your scissors very close to the reinforced edge. When you get to the other shoulder seam, cut along that. Remove the back portion of the shirt and set aside. You now have just the front panels of the shirt with the collar attached. Turn the shirt over so the button side is down. Find the point where the shirt attaches to the collar on one side. Fold this side over at an angle and adjust the fold so that it is about 18 inches long. This gives your apron an attractively tapered bib. Use the iron to crease the fold you made. Cut a strip of fusible web about 1/2 inch wide. Follow the product instructions to use it to secure the folded fabric and give your apron a finished look. 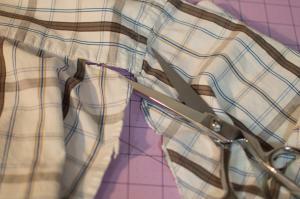 Use pinking shears to trim off the excess fabric inside the apron. Repeat the previous step and this step with the other side seam. Flip up the collar. 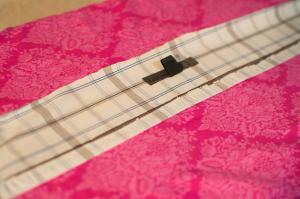 Place a strip of fusible web under the back of the collar and fold it back down. Iron to adhere. On one side of the apron, find the point where the angled bib meets the remaining portion of the side seam. Cut a vertical two-inch slit about half an inch from this corner. Repeat with the other side. You'll use these slits to secure the apron belt. Set the apron front aside. Pick up the back of the shirt, which you set aside earlier. Lay it right-side-up on your work surface. Starting at the armpit, carefully cut one of the sleeve seams until you reach the back yoke. 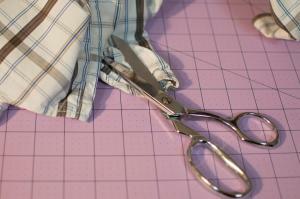 Turn your scissors and cut along the bottom edge of the yoke until you get to the other sleeve. Cut back down the sleeve seam to the other armpit. This frees the back body panel of the shirt from the yoke and sleeves. Set the back body panel aside. Turn the yoke and attached sleeves over so they are face-down on your work surface. Trim the top edge of the yoke so it is straight. Use more strips of fusible web to turn the top and bottom raw edges of the yoke under. 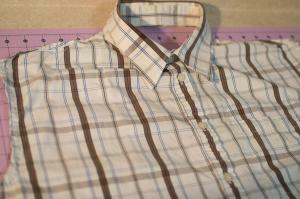 The width of the yoke will depend on the shirt you use, but you want the finished strip to be at least two inches wide. Cut down the seam of each sleeve. 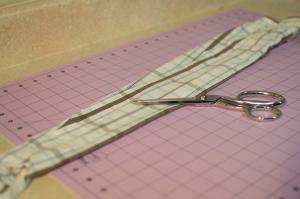 Trim off excess fabric and arrange the remaining sleeve fabric to make ties. Use fusible web to secure the layers for a finished look. This is the apron tie. Thread the apron tie through the two slits you made in step six. Unbutton the first few buttons to slip the collar over your head. Tie the sleeve ends behind you and enjoy your new apron. If you're looking for some other designs, try one of these fun aprons. None of them require previous crafting experience. Easy Square Apron - This super-simple apron from A Beautiful Mess is a great choice if you'd like something simple and easy to customize. Try different fun fabrics and trims to create a unique look. DIY No Sew Kids Apron - If you need a kid-sized apron, look no further than this quick and easy project from Say Yes. It's adorable and affordable at the same time. No Sew T-Shirt Apron - You can make an apron from an old T-shirt using this easy tutorial from Sawdust Girl. All it takes is a cast-off T-shirt and some cutting tools. Aprons and other no sew projects let you get creative without the hassle of getting out the sewing machine. Have fun making and wearing this cute cooking accessory!